My great grandmother is one of the three little girls pictured here. 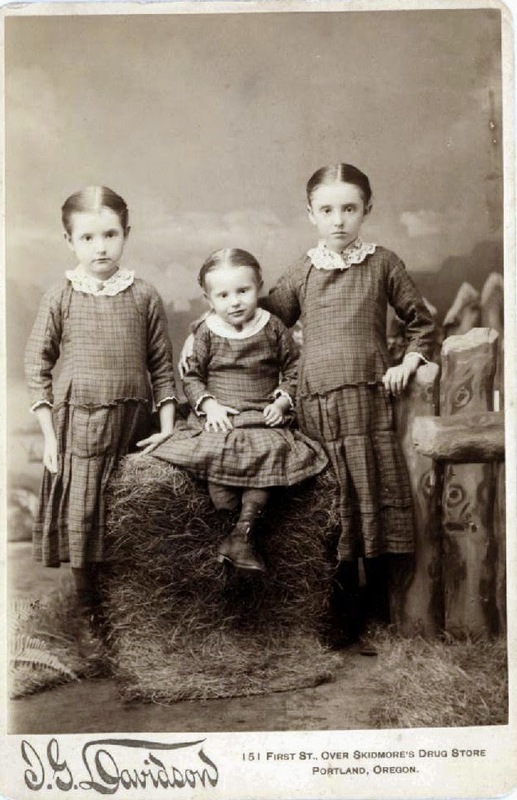 From left to right they are: Estella Rachel Channell Eckerson, 1878-1965, Emma Alice Channell Eshom, 1881-1958, and Mary Margaret Channell, 1875-1884. They were the daughters of Edward Channell and Jane Foglesong, who had married in Van Buren County, Iowa. The whole family came to Washington Territory in September of 1881, settling in Centralia, Lewis County. As Mary Margaret only lived one day past her ninth birthday, she must not have lived very long after the visit to the photographer. Note that the photography studio was "over Skidmore's Drug Store," in Portland, Oregon. I love the prop fence, and the roll of hay-like material the toddler is sitting on. "Stella" Eckerson lived the longest of the three girls, which meant our lives actually overlapped for a time. I, of course, remember her as an old, old, woman. If you'd told me she was 150 years old, I probably would have believed you, but in reality she was in her eighties. Her only son and her granddaughter, my mother, inherited her long, bony wrists. All three of them looked very much alike in old age. I remember our family going in the summer to visit her at her house, two states away, where she was always kind and welcoming, although I believe she had a rather wry wit. She also came to California on a visit, very late in her life. We have a few photos of her during that time. She had on a dress, nylon stockings, and dress pumps; I don't think she owned any pants. I remember her always in a dress of some sort, and a cover-all type of apron. Living alone, her one weakness seemed to be a collection of "Radio-TV Mirror" magazines. Looking at copies online brings a smile: they're filled with ads for products like Listerine and girdles, and have a lot of gossipy tidbits about the celebrities of the time. The one I saw featured Art Linkletter on the cover. My great-grandmother lived a life that observed many changes, moving across the country from small-town Iowa to a different Territory, a country at war more than once, a long widowhood, the dawn of the space age, and being kept company by broadcast entertainment. A very long time, indeed, since she was the solemn little girl in the photograph. Estella, Emma, & Mary Channell, l. to. r.